Hidden Falls on Cascade Creek in Grand Teton Nation Park, Wyomimg is accessed by a mountain trail around Jenny Lake near Jackson. Union Falls on North Mountain Ash Creek in Yellowstone Nation Park, Wyoming is one of the tallest in the park at 210 feet tall and it gets its name because of the union of three creeks at the falls. Shoshone Falls on the Snake River near Twin Falls, Idaho is know as the Niagra of the west because of its size and power. Lower Yellowstone Falls on the Yellowstone River as it drops into the Grand Canyon of the Yellowstone in Yellowstone National Park, Wyoming. Cave Falls on the Falls River in the very southwest corner of Yellowstone National Park, Wyoming, near Ashton, Idaho. This photo was taken from inside the cave next to the falls which is where the name came from. You will never be able to take this photo again as the cave collapsed a couple of years after this photo was taken. Latourel Falls in the Columbia River Gorge along the Columbia River east of Portland, Oregon. Upper Mesa Falls on the Henrys Fork River near Ashton, Idaho is a popular attraction in Fremont County and the rainbow adds a touch of artistry to the photo. Iris Falls on the Bechler River in Yellowstone National Park, Wyoming is almost a mirror image of Upper Mesa Falls near Ashton, Idaho and the rainbow adds so much to the scene. It is about three miles upstream from Colonnade Falls. 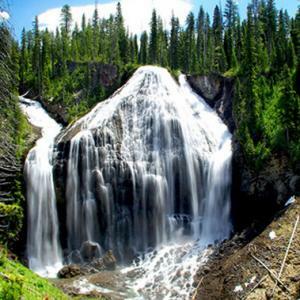 Colonnade Falls is a double falls on the Bechler River in Yellowstone National Park, Wyoming and is accessed by a long hike through Bechler Meadows. Lower Yellowstone Falls on the Yellowstone River in Yellowstone Park, Wyoming is so awesome as it plunges into the beautiful Yellowstone Canyon and is twice as tall as Niagra Falls.